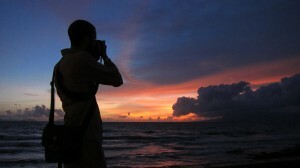 In Kep we got out and about a bit more than we did in Kampot. But only a bit more. Kep is a weird little town with not much to offer but fresh blue crab and a lovely place to relax. It’s located on the ocean, with stunning sunsets, and was founded by French colonialists sometime in the early 1900’s as a fashionable sea-side hang out. 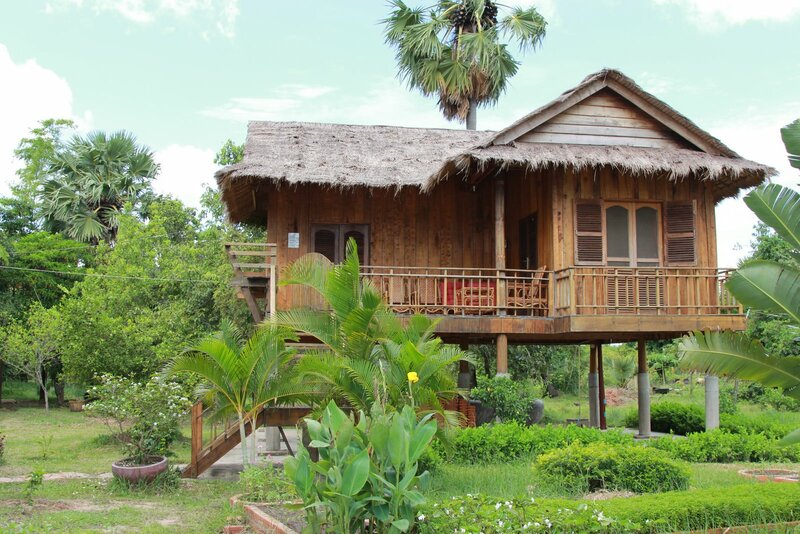 After independence, wealthy Cambodians continued the tradition. However, the flashy and flaunting ways of the elite didn’t sit well with the Khmer Rouge during their war on the Cambodian people and they gutted the town. The abandoned, bombed-out and blackened French villas are a stunning but eerie reminder of days past. However, Kep is making a come back. Every expat we met who lives in Cambodia went out of there way to give us two pieces of advice: 1) go to Kep and skip Sihanoukville, the more popular but too packed and touristy of Cambodia’s beach towns. And 2) that we should splurge and stay in the best hotel in the country there. 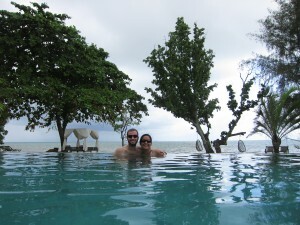 We heeded their advice on both counts and used my sisters wedding present for some R&R at the swanky Knai Bang Chatt. The hotel did not disappoint. Though it drizzled a little while we were there we loved being there during the week and having the run of the place mostly to ourselves. 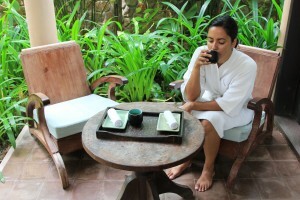 The hotel buildings and rooms (there are only 11 rooms in total) are housed in 5 restored french colonial villas. We lived it up for a few days in the nicest hotel rooms we’ve stayed at in months, eating the delicious blue crab and seafood Kep is known for, getting a massage for all the hard work we’ve been doing and enjoying the beach-side infinity pool (in both rain and shine). A vacation from our vacation if you will. Total bliss. Thank you Gillie and Anthony! 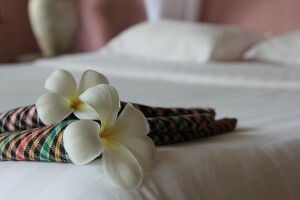 Fresh flowers with traditional Khmer Kramas (scarves) as presents. 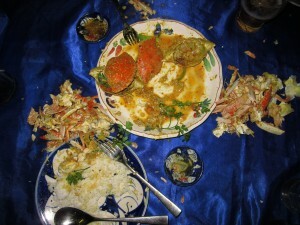 The remains of a crab dinner with Kampot black pepper sauce. Yum. afterall it is your honeymoon. Looks like a heavenly place to relax. Enjoy! I love all the pics. Thanks for posting.